Recently over 160 Legislators voted in support of a 0.5% tax on mobile money withdrawals. They strongly believe that a 0.5% tax when collected will enable government finance its projects. 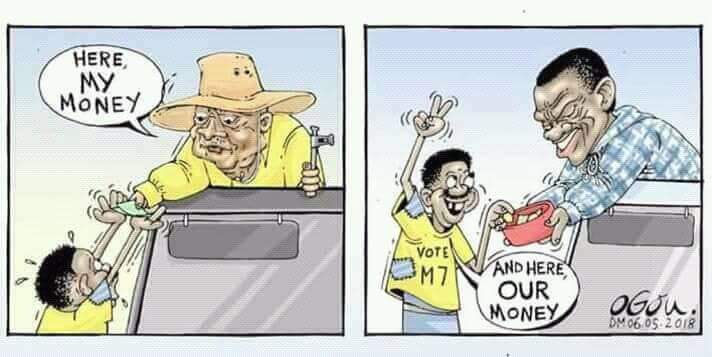 Since these MPs are patriotic, and fully supportive of the governments move to realise over 280billions in mobile money tax revenues; i propose the payment platform for all MPs be changed such that they start accepting their salary and allowances via mobile money platform. If the 453 MPs are enrolled on government Mobile Money payment platform with their gross income of 25m currently paid; MPs can raise a monthly tax of 125,000/-shs. So 125000 x 12months =1.5m as taxes from an MP annually. This means that 453 MPs x1.5m = 679m will be generated from the patriotic MPs annually. The government will also collect over 400M as MPs continue to transact say paying their labourers or shopping. Please the Patriotic MPs accept to enroll for the mobile money payment platform, hence enabling government raise the required revenue for the government to finance its projects.